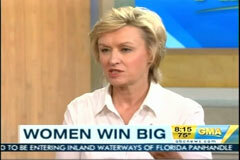 Former New Yorker editor Tina Brown appeared on Thursday's Good Morning America to deride the mostly Republican women who won primaries on Tuesday as "wingnuts" and to sneer that they represent a "blow to feminism." She then added, "Women, too, can be wing nuts, is the point." Crier offered the developing liberal line that Meg Whitman and Carly Fiorini's business experience could now be a liability: "I think it's quite interesting that the whole CEO movement out there in California. Because, here we are with all the Wall Street consternation and, yet, they're touting their credentials as major CEOs as qualifications." Stephanopoulos, a former aide to Bill Clinton, echoed this talking point: "Meg Whitman head of Ebay. Carly Fiorini ran Hewitt Packard. There's some controversy there." There's controversy to being a CEO at Ebay? In fairness to Stephanopoulos, when Brown offered her critique of Republican women derailing feminism, he did protest, "Well, you could argue they're different kinds of feminists. They've had a lot of success in different fields." However, the semi-weekly Morning Mix segment is comprised mostly with left-wing opinion. On April 22, 2010, Sam Donaldson lobbied for Al Gore to be placed on the Supreme Court. On March 12, the panel featured a chorus of liberal voices to sympathize with disgraced Democrat Eric Massa and retiring Congressman Patrick Kennedy. An odd point not discussed on Thursday's panel: Meg Whitman and Blanche Lincoln were included in this list. Lincoln, of course, is a Democrat. Whitman is pro-choice. So, it's unclear (from a liberal's perspective) what, specifically, Brown thought would set back feminism. GEORGE STEPHANOPOULOS: And it's time, now, for our Morning Mix, where we have some fun with the big stories that everyone is buzzing about this week. Starting with women rule. Huge election night Tuesday for female candidates. They won all the big races. Also, men behaving badly. Joran Van der Sloot and quarterback, Ben Roethlisberger, back in the news. Real questions how law enforcement handled that behavior, too. Here to talk about it all, Tina Brown, editor-in-chief of The Daily Beast. And author, journalist and judge Catherine Crier. Welcome to both of you. And let's begin with election night. All the big races won by women. Five big winners that night: Carly Fiorina, Meg Whitman out in California. Nikki Haley, surprise out in South Carolina. Sharron Angle in Nevada. Blanche Lincoln, holding on in Arkansas. And this was something remarkable. I mean, every big race won by a woman. TINA BROWN: Yeah, I mean, it was. I mean, in some ways, it's, again, representation that people are looking for otherness. You know, they're so disgusted with incumbents, they're looking for something completely different. And, as it happens, of course, women usually are seen as, you know, an alternative because many more men are in there. But, actually, the only trouble with this one is, it almost feels as if all these women winning are kind of a blow to feminism. Because, each one of them, really, most of them, are, you know, very much, uh, uh, you know, against so many of things that women have fought for such a long time. GEORGE STEPHANOPOULOS: Well, you could argue they're different kinds of feminists. They've had a lot of success in different fields. CATHERINE CRIER: This is true. This is true. But gender didn't play as big a role, which I think is the one positive note here. -Is that it wasn't really a conversation until we got to a hair issue, which I think we'll be talking about later. Yeah, but I think that's very, very important. But it's a great concern that what I'm seeing is people will realize that women can make the same mistakes. And get clay feet, as men. BROWN: Women, too, can be wing nuts, is the point. STEPHANOPOULOS: That's part of it. But, Nikki Haley down in South Carolina, she faced allegations that she had affairs. CRIER: But she was in the right state for those allegations. STEPHANOPOULOS: I guess. I suppose that's right. BROWN: Yeah, Nikki Haley beat that back. That was very interesting. I mean, that was actually encouraging, I thought. CRIER: But, there was other scandal that I think dominated that. And other outrageous comments by South Carolina politicians. So, it made that look relatively benign. STEPHANOPOULOS: That's right. Talking about outrageous comments. Carly Fiorina after the election, getting caught on tape. Men have had this happen to them as well. She didn't remember she was on camera. Let's take a look. CARLY FIORINI: Laura saw Barbara Boxer briefly on television this morning. And said what everyone says. God, what is that hair? So yesterday. STEPHANOPOULOS: That's Barbara Boxer. There she is. There you see it! Uh-oh! I am on camera! BROWN: You know what I love about it so much? It's like, as we were saying, as Catherine was saying, it was great that it was gender-neutral. Then, all of a sudden, you've suddenly switched to absolute claws come out. And it's like- the women. What really killed? It was so yesterday. It wasn't just women. It was rich women. That's the point. CRIER: That's right. That's right. I think it's quite interesting that the whole CEO movement out there in California. Because, here we are with all the Wall Street consternation and, yet, they're touting their credentials as major CEOs as qualifications. STEPHANOPOULOS: Meg Whitman head of Ebay. Carly Fiorini ran Hewitt Packard. There's some controversy there. CRIER: And, here, with BP, with Wall Street, is that what the American voter wants, a CEO running?